5 Stars - Highly Recommended by Drew! The Short Version: A collection of short stories that all seem to focus on, in one way or another, the weirdness of modern American life. The simple oddity of suburbia - the terror, the pathos, the warmth, the... well, the Americanness of it all. Some stories are simple, others a bit fantastical, but they all spin around that same '50s-esque invitation implied by the cover: that that green lawn and simple home might just be the closest we get to paradise. The Review: Graywolf Press is one of the mightiest indie presses publishing today - just check out the simple weight of a collection like this one or Kevin Barry's Dark Lies the Island. The stories lend themselves to individual doses; you can read one, put the book down, and come get another later that day or perhaps the next day. They are not necessarily all fantastical (although some certainly are) but they all seem to capture the fantastic nature of everyday life with an ease and keen sense of observation that appears effortless (although I'm sure is anything but). Lennon's last novel, Familiar, was my introduction to the man's work and I found it interesting but slight - I enjoyed, but did not love or really feel terribly passionate about, it. 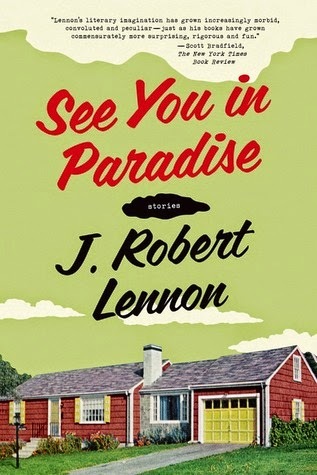 But from the very first story here, it was clear that Lennon is an uncommon talent and perhaps even one of those rare writers who can achieve great things in that hardest of forms, the short story. "Portal", that first story, tells of a magic portal that turns up in a suburban backyard - but Lennon allows it to be as mundane as any other 'feature' of a new house. The family travels through it from time to time as a sort of bonding adventure... but slowly, despite this magic in their lives, they drift as any family might. The magic doesn't save them, it doesn't even really necessarily change them - it just becomes a part of their lives that shifts as time goes by. But the real trick is having put this story first: it forces the reader to stay alert for the rest of the collection. Because the rest of the collection does not feature much magic or fantasy - indeed, really only two of the further tales do. But as the next story, "No Life", begins (a relatively/comparatively mundane story of two families vying over an adoption [note: the story itself is not mundane, it's actually quite good, but the circumstances... no magic portal... you know what I mean]), the reader wonders just a little if something weird is going to happen. Slight spoiler, it doesn't - at least, not in the way that a reader might've anticipated (e.g. magic or some fantastic twist) - but the slight instability in the reader's mind lingers and that seems to benefit the collection as a whole. It also helps to read these stories in the setting that they were, perhaps, intended for: suburbia. The petty arguments, the strange rivalries, the unfathomable depths of the human experience that hide behind the well-kept facades / within the air-conditioned walls of suburban homes... it's an never-ending repository of possibility. Perhaps your neighbor, too, purchases a hibachi grill for his wife. Or maybe they're having a party to memorialize the passing of their dog. You don't know how the folks down the street's family vacation went - heck, you might not even know that they went on one. But for those who live in suburbia (or even those who might be visiting it shortly), gather this collection to take with you [ed. note: ...once it comes out in November. Sorry for the tease, folks.] and allow it to color your imagination as you drive down those tree-lined (or not) streets with the manicured lawns and mod-cons. Even the stories that spin off out of so-called "suburbia" and into the city or into the wider world retain some sense of that non-city-life. These are not stories of major metropolises and the people who live in them but rather everyone else. The large majority of the country, in fact. And those who have only ever lived in a city might not understand the appeal. But that's because we've been taught that the city is where life evolves, while the suburbs are where it just happens. But if you're one of the people where life is just happening, don't you think it feels like an evolution to you? That's the thing of Lennon's stories and it is a marvelous trick. Rating: 5 out of 5. None of the stories leap out as better than the others, per se - I don't know that there's one where you'll go "OH WOW!" and post it up as a banner example of Lennon's work. Instead, each of the stories spins together into the whole and makes this collection that oh-so-rare example of being greater than the sum of its individual parts. And those individual parts are all good. They are not connected, they are not linked - they are just all solid pieces of short fiction. And reading them on a porch or in air-conditioned suburban 'security' was just one of those perfect confluences of time, place, and story.